I love experimenting with cold fermentation for developing flavorful bread dough. I started a new (for me) bread experiment yesterday, based on the technique of Peter Reinhart’s book “Whole Grain Breads: New Techniques, Extraordinary Flavor“. In the book, Peter advises to mix both a mash and a biga, refrigerate for at least 12 hours, then mix up a new dough with the two plus a small amount of ingredients. I decided that I would try mixing one biga mash together with no sugar, oil, salt and just a touch of instant yeast, refrigerate for a day, then mix up a new dough using the biga mash with new flour and ingredients. The result was a fair success! 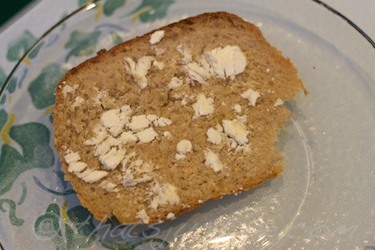 A yummy fluffy high rising whole grain bread. I love a hearty dense loaf, but sometimes you just want bread to be light and airy! I still need to work on this technique though, although the taste is fantastic, the “crumb” is usually too crumbly and the top crust pulls away. By the time I get to the middle/end of the loaf, it’s usually difficult to slice thinly. I think it might be an issue of not shaping my loaf properly, or it could be over-proofing (final rise). I don’t think it’s an issue of too much milk and/or oil but maybe my dough needs more water. It’s also possible that I am not kneading long enough, but that seems hard to believe since I’m using a machine for the final dough. I’ll have to do some additional reading on the Fresh Loaf web site, and maybe re-read Peter’s book. There is still so much to learn! Anyway, here is my process. It only take a few minutes to mix up the biga soaker dough. Note: I use the West Bend 41300 Hi-Rise Electronic Dual-Blade Breadmaker for all kneading. 1 cup milk product. I used So Delicious unsweetened coconut milk, but I have used almond milk in previous recipes. It’s possible to process the bread dough using the “dough” setting, but you should NOT allow it to rise the bread. Shut off the machine after the kneading process finishes, and remove the dough before the warm rise step. Stop the bread maker for an autolyse rest for 20-30 minutes. During this resting time, leave the dough in the bread machine pan. After 10 minutes, shut off machine again, and allow a short rest of 2-3 minutes before transferring the dough (using wet hands) to a bowl. Cover bowl and keep in fridge for at least 12 hours and up to 3 days. Take the dough out of fridge, allow to warm up for at least two hours. Chop up dough into several smaller pieces, using pastry scraper or sharp knife. Using the bread maker dough setting, combine all ingredients in bread maker and allow the machine to do it’s thing including the rise. When machine is finished, wet hands, and pull dough out of the pan. Gently form into loaf shape and place into loaf pan (lined with parchment paper)- this is where I might be going wrong. I think I am not shaping the loaf correctly. Remove from loaf pan and allow to cool for at least an hour. 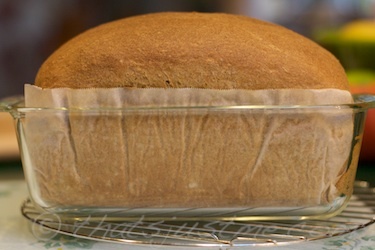 Makes one 30 oz loaf (after baking and cooling) – even better, it’ll also make two smaller loaves too! I’ve been experimenting with bread dough, and have found that a long slow fermentation makes the most flavorful, delicious bread! I experimented with my own recipe, but wanted to keep exploring. I’m all about whole grains, so reading Peter Reinhart’s Whole Grain Breads: New Techniques, Extraordinary Flavor seemed like the next logical step! I’m really not into hand kneading, even when authors say how easy it is. I have no patience for it, even if it’s only for a few minutes. I use my bread maker and I am very happy with it! I started with a one paddle Breadman, and recently purchased a West Bend 41300 Hi-Rise double paddle breadmaker, which I absolutely love! Anyway, my first crack at his recipes (Multigrain Stuan recipe – page 102) was a semi-disaster, but I was so proud and happy to finally be working with a soaker and biga! Whoo hoo! My second try at the same recipe was better. My soaker consisted of random amounts of cornmeal, barley wheat, wheat germ, oat bran, and wheat bran. The cornmeal gave it a pleasant texture. 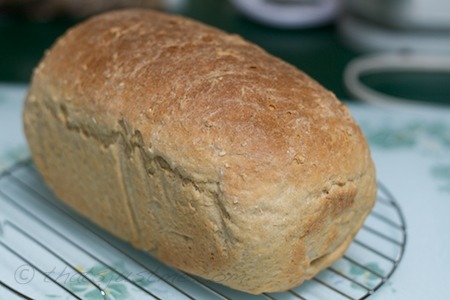 Next, I tried the Transitional Whole Wheat sandwich bread recipe (page 99) and yum, it really turned out well. Just look at the oven spring! 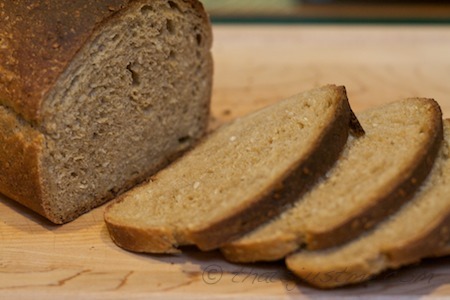 Most Delicious Flavorful Whole Grain Bread! I’ve been experimenting for a few weeks, and I think I’ve found the trick to making delicious flavorful bread dough. It’s easy, but it’s time consuming, taking about 2 days to complete. 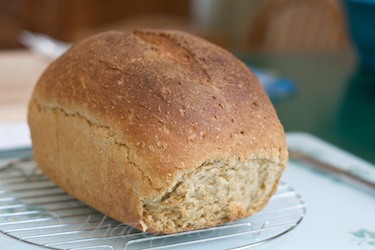 You can use any whole grain/whole wheat bread recipe, but reduce the yeast amount to 1/2 or 3/4 tsp. Author debbie @ That's Just MePosted on October 17, 2010 October 17, 2010 Categories Bread, RecipesTags bread, FOOD, healthy, Recipes, whole grain, whole wheat, yeast bread2 Comments on Most Delicious Flavorful Whole Grain Bread! Bought some Arrowhead Mills Barley Flour this week. I’ve been wanting to branch out into baking with different whole grains and barley seemed like a good option to start with. I’ve been reading a few good books on whole grains, so it’s been interesting to learn about new ingredients! I added 1/2 cup of barley flour to my bread dough this afternoon. We’ll see if there is a noticeable difference! Update: the bread is delicious! I made whole wheat sunflower rosemary bread. So good! I’ll use a little more barley flour next time! 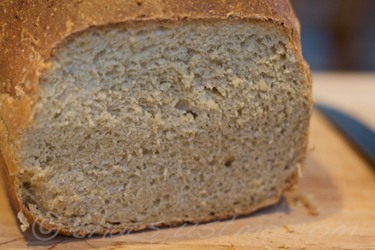 INSPIRATION from the Kitchen Bootcamp – this month’s challenge is yeast breads. I tried to think outside the box and try something new…very timely since I think my wonderful (and old) bread machine died this morning. I don’t know if it’s recoverable, we’ll see if DH can fix it. The ingredients were in the machine bucket, and I set it for “dough” and NADA. I could hear a slight clicking noise coming from the motor underneath the paddle, so initially I thought that maybe it was jammed or not placed correctly. I tried, but I couldn’t get it to work, so I thought, well, maybe this was a sign. A sign to try something new and get out of my comfort zone. So, I transferred all the ingredients into a large ceramic bowl and started to mix with a spoon. It was so dry; I started to mix with my hands. It was horrible. My hands were immediately clumped with sticky dough. I was trying to remember all the advice that I previously learned in books, on web sites and from other bread bakers. I decided that instead of dusting with a ton of flour, I would keep wetting my hands and try to knead that way. I found a great “cooking challenge group” called Kitchen Bootcamp. The challenge this month is yeast bread, so I’m trying to bake out of my comfort zone. It’s tough because when I bake bread (twice a week), I just don’t have the time to experiment with new techniques, but when I realized my loaf pan was in the dishwasher, it forced me to improvise. I baked 6 smaller loaves. 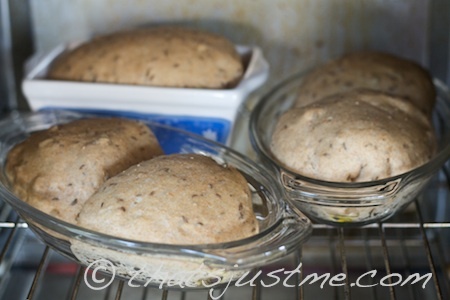 Two in smaller loaf pans, and four rolls in 2 small glass baking dishes. I need more experience with baking smaller rolls, and this was good practice. Next time, I am going for real rolls! This recipe isn’t 100% whole grain, but it’s still a very good source of fiber! No added sugar, except for 3 Tbsp of Orange Juice. I didn’t have much trouble shaping the dough, but they did stick to the pans slightly, even when they were oiled. The bread tasted delicious though, and that’s all that matters in the end, right? 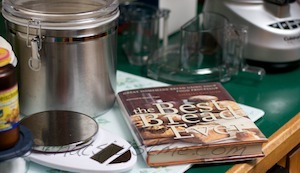 I found a copy of the book “The Best Bread Ever: Great Homemade Bread Using your Food Processor” at the library. I was intrigued because he introduced a technique for mixing bread dough in a food processor. The book is currently out of print (it was originally published in 1997), but there are used copies for sale on Amazon and you can also find the original recipe & specific instructions online if you want to try it. I decided to try the technique today. As usual, I was nervous and hesitant, but I got all my tools and ingredients ready to go before I started. When will I learn? Hahaha. I just don’t seem to be meshing with the no-knead bread craze! Whenever I try, it always seems like more work to me, and always makes me feel intimidated by the sticky flimsy dough! Very frustrating. But I keep trying. I’m sure this will not be my last attempt, especially now that I think I know the error of my ways! Of course, being in a semi-rush, I didn’t read the recipe notes, I just threw myself into the ingredients. sigh. Looking back at the recipe now, it clearly states that a 1:1 ratio of flour & water is necessary. And she used a regular loaf pan, something I probably should have done as well, since I like the shape better. And of course I didn’t dust with more flour to make the dough less sticky and easier to work with! I won’t even bore you with my baking notes, since it really wasn’t a triumph. In the end though, the bread was tasty, and I guess that is all that matters. It was just a bear to work with and I would love to say ‘NEVER AGAIN’ but I’ll probably be trying another batch of no-knead when time permits! I found two no-knead books at the library: Jim Lahey’s My Bread: The Revolutionary No-Work, No-Knead Method, along with the Kneadlessly Simple: Fabulous, Fuss-Free, No-Knead Breads book. Sometimes my bread comes out pretty good, and sometimes it has small issues. For instance, my oatmeal bread from yesterday. The first slice looked and tasted fine…but then this morning, when I sliced a few more servings, I noticed the crumb was a little too crumbly and the crust was coming unattached. I have had this problem before and I am pretty sure in this instance, it’s due to incorrect shaping. I must not have formed it properly; I was having a bit of an issue with the dough kind of getting too large, and I had to kind of quickly reshape it. Another reason could be over-proofing, and yeah, my dough rose pretty quickly yesterday. I think I am going to experiment with adding less yeast next time, so it will require a longer slower rise. I might try taking the dough out of the bread machine right after the knead, and allow it to rise in a bowl. And I was thinking last night, and I might have figured out how to use a more traditional autolyse even with the bread machine. Adding all the liquid and only SOME (maybe half) of the flour. I’ll try allowing the bread machine to mix for 3 minutes, then shut off the machine. After 30 minutes, I will add the rest of the flour, salt and yeast, and allow it to mix normally. Or…I might add the yeast initially. We’ll see. http://sourdoughhome.com/trouble.html – yes, it’s a sourdough web site, but there is a list for general baking troubleshooting and I find it very helpful! My DH asked me if next time, I could make a “whiter” bread for him, so this “transitional” bread recipe is for my wonderful dear husband. Even though it’s not 100% whole grain, it still offers a good amount of fiber! Inspired by the Oatmeal Bread recipe found on King Arthur Flour’s web site. October Unprocessed 2013 with Bob’s Red Mill Coupons! Coconut Palm Sap/Syrup, Responsible & Sustainable, or Not? God grant me the serenity to accept the people I cannot change, the courage to change the one I can, and the wisdom to know it's me. Buy foods with ingredients that your grandmother (or great-grandmother) would recognize. When diet is wrong, medicine is of no use. When diet is correct, medicine is of no need. no food tastes as good as fit feels! When you try to solve your problems with food, not only do you not solve your problem, you create another problem. Never be afraid to sit awhile and think.